August 22, 2011 in Coffee | Tags: Advertising, Bodum, Bodum French Press, Business, chimp, Chimpanzee, French press, In the Air Tonight Gorilla, Marketing, Phil Collins, Phil Collins Gorilla Commercial, Planet of the Apes, Why is Bodum advertising with a Chimp? Seriously? 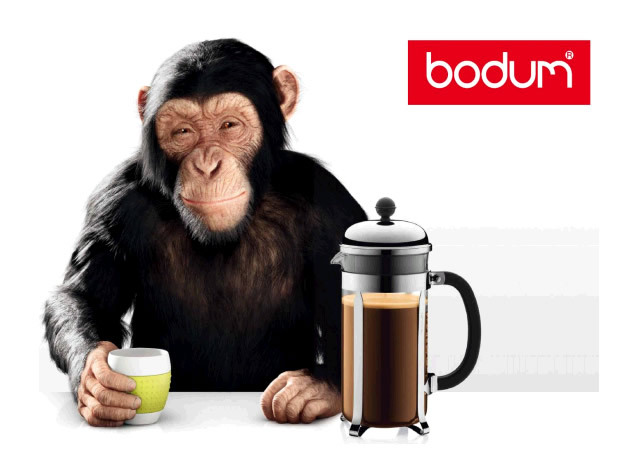 Bodum’s latest marketing campaign for their French Press coffee makers are centered on Chimps. For real. I don’t know if they are trying to capitalize on the whole Planet of the Apes reboot, or if they are trying to steal the “It’s so easy a caveman can do it” concept. Either way, this is pretty ridiculous marketing. I just can’t get over this. I’m not necessarily opposed to using apes/chimps in advertising for something that has nothing to do with apes/chimps, as is evidenced by my earlier post. But this campaign seems completely random, without much humor. PS – I still love my Bodum French Press, I just wish they used different advertising methods. Where in the world do you find the videos????? Love the drum set!!!!!! Oh yeah, I thought it was extra weird that Bodum used a Digi Chimp for their latest Marketing efforts. I love my Bodum products, they have a certain cool factor along with their functionality. But I’m sorry that Chip super Creeps me the hell out! It’s totally as if the Reboot Pre-quel Planet of Apes Ape stopped by to make some extra cash while capitalizing on a hit movie, something normally reserved for the likes of Mickey Rourke, lol.